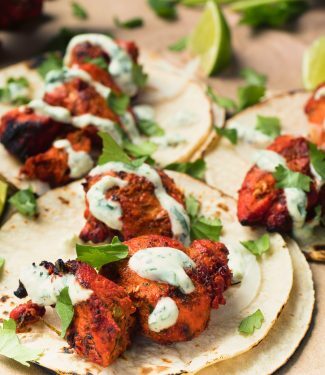 Tandoori chicken tacos. People are making all sorts of funky tacos these days. Korean bulgogi tacos. Japanese teriyaki tacos. Thai shrimp tacos. 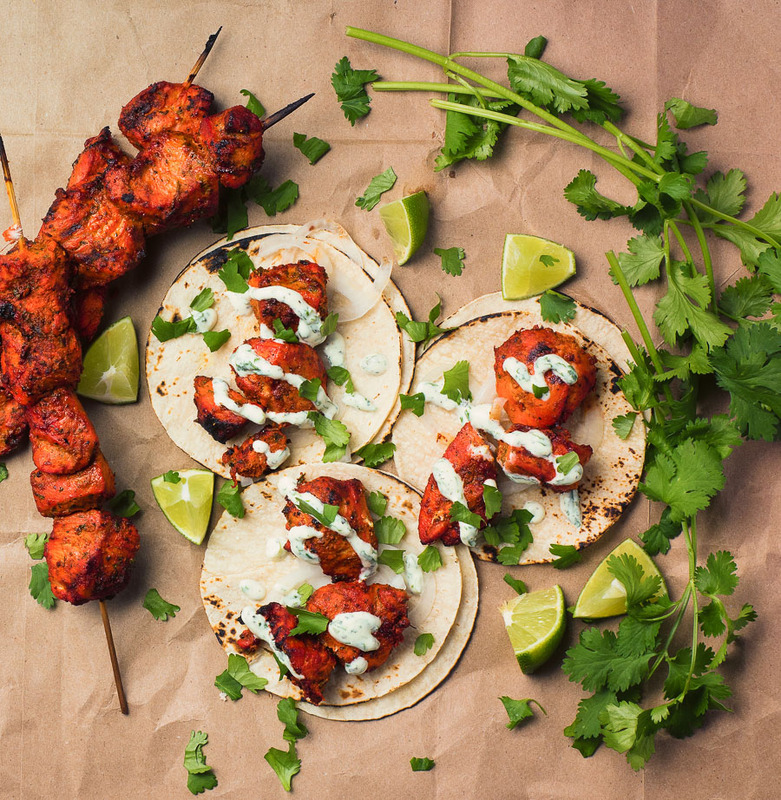 Why not Indian tandoori chicken tacos? These are a great way to mix things up. To break out of your taco funk. For when you want something new. You can do them straight up as tacos or use an Indian flatbread. If you can get your hands on some parathas you can make one crazy sandwich. This may seem a little odd but think about it. Little bits of super tasty grilled chicken. A drizzle of sauce. Corn tortillas. Cilantro. Lime. That sounds like a taco to me. Chicken tikka is the perfect way to get maximum tandoori flavour into the smallest possible form factor. Forget shredding tandoori chicken. Tikka are little flavour bombs waiting to be wrapped in a tortilla. Smothered in a cooling yoghurt drizzle. Brightened with a bit of cilantro and lime. Perfect! Don’t just use chicken tikka for these tacos. Once you try them you’ll understand why. Think boneless tandoori chicken bites. Perfect party food. This is a fast weeknight dinner. Taco Tuesday ready. Marinate the chicken before you leave for work. Skewer it when you get home. Mix up the mint raita drizzle. Dice a white onion. Grill them quickly and chow down on your tandoori chicken tacos. And use the mint raita whenever you serve chicken tikka. Or pappadum. Or any time you want to cool your meal a bit. It’s versatile that way. Dare to do something different. You won’t be sorry. 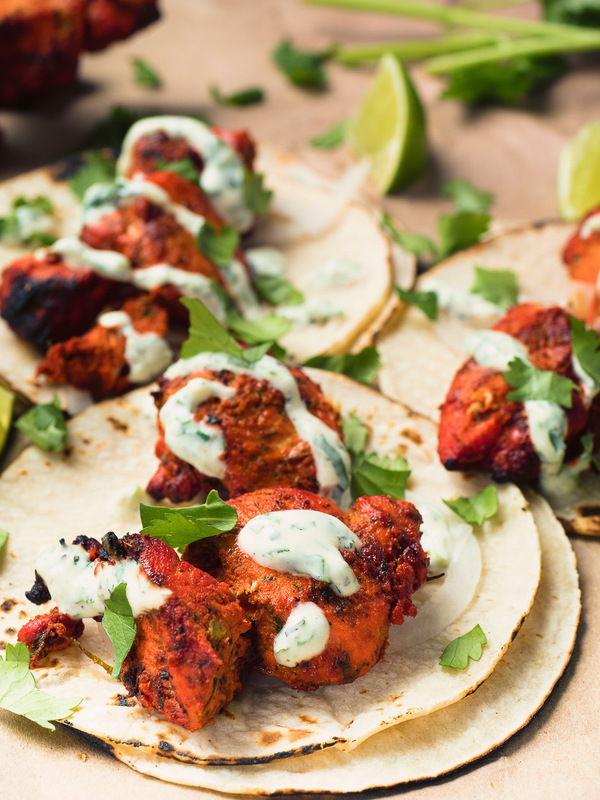 Tandoori chicken tacos are a great way to break out of your taco funk. If you like Indian cooking, you will love this taco twist. Warm the tortillas by wrapping them in a damp towel and microwaving them until warm. Assemble the tacos and drizzle with mint raita. Combine all the ingredients except the milk. Add the milk slowly, stirring constantly, until you get to the consistency of heavy cream. In indian, main course, poultry. Bookmark the permalink.